How often should I follow-up with my practitioner? In general, when you have any skin problems (for example, redness that does not go away in 20-30 minutes after using your orthosis or prosthesis) or pain while using your prosthesis or orthosis, you should follow-up with your practitioner. If you notice that your device is not functioning properly (ankle joints not operating well, prosthetic knee is not bending appropriately) we also recommend that you call and follow-up with us. If your prosthesis is fitting and working well, it is still a good idea to come in about every 6 months. We can inspect your prosthesis for signs of wear as well as look at your liners, sleeves, and socks to make sure they are in optimal condition for use with your prosthesis. It's a great idea to follow-up with us regularly so we can catch any problems early. At the beginning of the process, when you first receive your prosthesis, we may see you more regularly for follow-up, as your limb may be changing quickly. However, over time these changes usually slow down and less frequent follow-ups may be more appropriate. We will normally call you to follow-up with you about every 6 months to see how you are doing. We recommend an annual follow-up for orthoses. This is especially important if you have an orthosis that uses ankle or knee joints that may need maintenance or replacement. We will normally call you once a year to check in and see how you are doing. In all cases, if something does not fit or function well, please contact our office at 410-636-8114. We may be able to resolve issues over the phone, and if not we look forward to seeing you in our office! What kind of education does my practitioner have? Many people do not know about the education involved with becoming a Certified Prosthetist or Orthotist, as our field is fairly small. This is a common question our patients ask of their practitioners. The education level for prosthetics and orthotics was raised in 2012 to a master's degree. Prior to 2012, practitioners would complete their bachelor's degree in a major of their choice, and then complete a separate certificate for orthotics and prosthetics. Now, there are no certificate programs available. The only route to become a practitioner is to complete a Master of Orthotics and Prosthetics program. Once the master's degree is completed, a clinical residency must be completed. Residents can opt to focus on one discipline at a time for 12 months each, or do both orthotics and prosthetics together over the span of 18 months. During residency, residents work under the guidance of the clinical director and clinical mentors to learn patient care, proper documentation, and fabrication techniques. 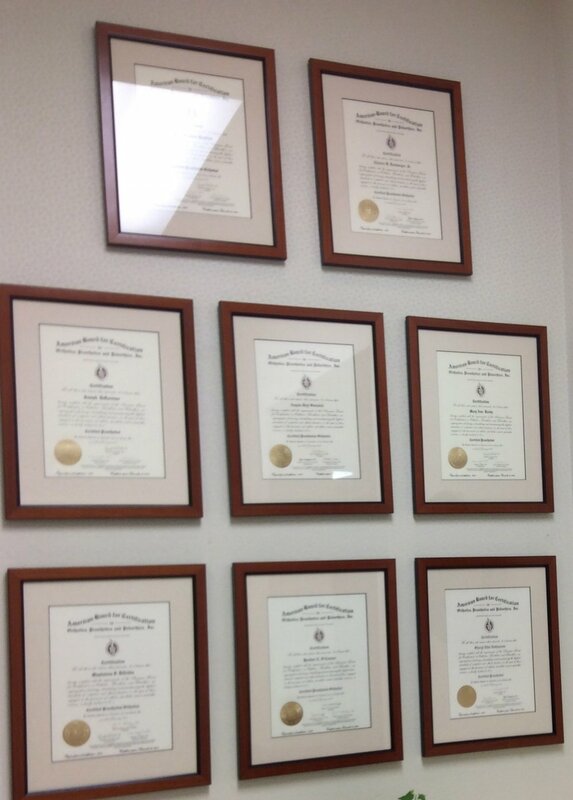 Following the successful completion of the residency, residents then take their board exams. There are three exams per discipline. One exam per discipline is a clinical exam that takes place in Florida, where candidates are evaluated on their patient care skills and knowledge. After the candidate passes all of the exams, he or she is then bestowed the title of Certified Prosthetist Orthotist (CPO). Practitioners continue to hone their skills after the exams for the rest of their career by completing continuing education through conferences and courses. Dankmeyer's practitioners have completed education programs all over the country! You can read about each individual and their education journey on our Clinical Staff page.